C.A. Albright & Sons was established in 1911 and has been family owned ever since. We are proud of our heritage in this area and honored to have served our community for almost 100 years. Our certified auto technicians can fix and maintain your foreign or domestic vehicles and remain on the cutting edge of technology. We deliver quality fuel oil at the lowest prices possible and combine that with expert installation and maintenance services for heating and cooling systems. A long history of service... C.A. Albright & Sons, LLChas been serving our community for a century. Clarence Albright established his lumber coal cooperage, barrel factory, and blacksmith shop in New Baltimore near what is now called Albright Lane on Route 144. 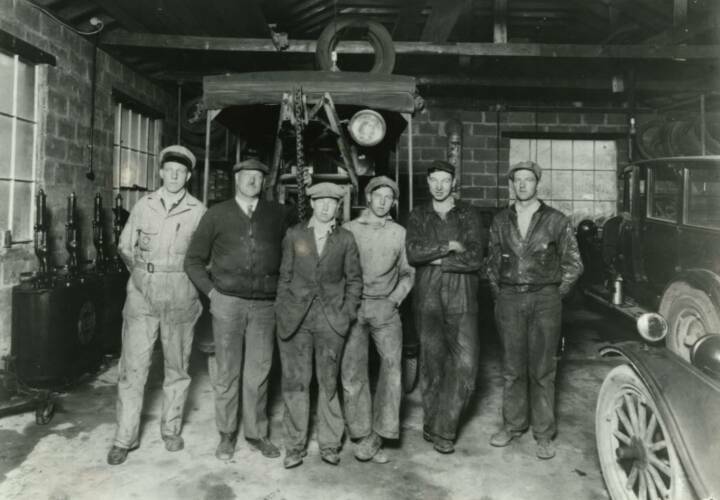 The blacksmith shop became the first automotive shop sometime early in the 1900's, and Clarence moved the automotive shop to the site on Old Route 9W as a garage and service station. The original building still exists. The picture to the right shows Clarence Albright and sons. From left to right, Larry, Clarence, Wilbur, Walter, Alfred and Arthur. Click on the image to enlarge and note the wooden wheels on the car in the front of the picture. 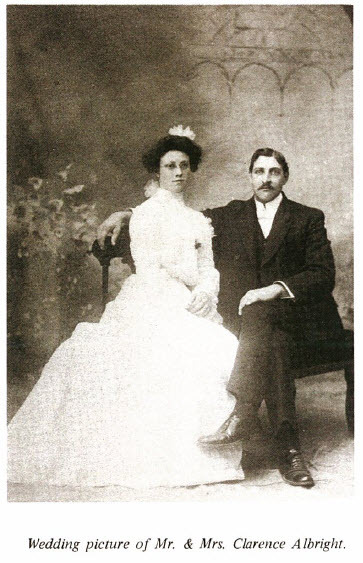 Clarance A. Albright had 10 children, 7 boys and 3 girls. All seven boys worked in the business but Arthur, Larry, Walter and Ralph eventually moved on to open their own successful businesses. In the 1930's the station offered "tubes, tires, accessories, refreshments and light lunches" . You could say that it was the first convenience store in the area. In 1940, the current garage was constructed to place the business facing the new 9W 'Superhighway'. C.A. 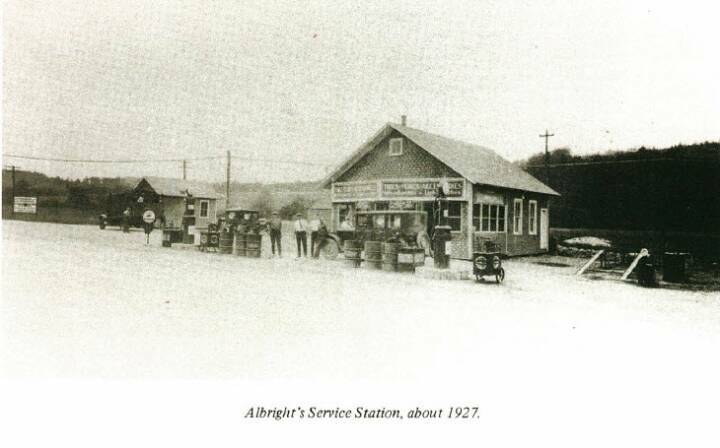 Albright & Sons added a franchised Ford dealership, garage and service station. This was also about the time that "& Sons" was added to the business name. Also, around this time fuel oil and kerosene sales were added. Upon C.A. 's retirement in the early 1950's, Alfred, Ernest and Wilbur formed a three-way partnership. With Alfred's premature death in 1957, Ernest and Wilbur were left as equal partners. Ernest retired in 1976. Wilbur, his son Eugene, and Ernest's son, William formed a three-way partnership. Upon Wilbur's retirement a few years later, Gene and Bill were left as the remaining equal partners. A new era begins... In early 2010, C.A. Albright & Sons, LLC was purchased by Randy Lent. Randy is a longtime employee and member of the Albright family and is looking forward to leading and growing the business into its second century. We will continue delivering great products and service while maintaining low prices to maximize value to our customers. A lot has changed since 1911. Take a look at some of the pictures below to see historical photos as well as photos of our current team and location.